The “Graphics” main menu contains the “Object Properties” sub-menu, in which you can change the settings for text objects, Sticky Notes, Text Snippets, and pictures. The sub-menu contains options for the “Fill Pattern…,” “Color…,” “Line style…” and “Angle…” of the selected graphic object. 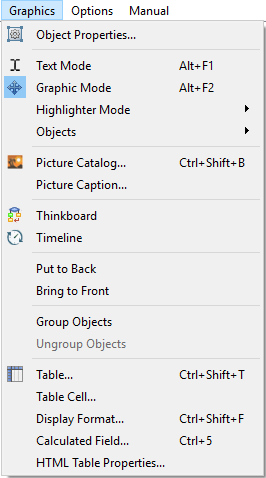 These graphic object properties can also be accessed in the context menu by right-clicking on a graphic object. You can also select “Position”→“Lock” from the context menu to protect a graphic object against alterations. The “Text Mode” is used to edit your running text; “Graphic Mode” is used to edit and resize your graphic objects and pictures. Papyrus makes moving and resizing your graphic objects and pictures easier with its magnetic guidelines, which you can simply drag out of the vertical and horizontal rulers with your mouse. They allow you to line up your graphic objects precisely. The sub-menu “Objects” allows you to create a new graphic object, such as a “text frame,” “rectangle,” “circle,” and a “line,” as well as “sticky notes” with six different colors. You can switch between text mode and graphic mode in the toolbar, as well as open the toolbar special for graphic objects (with the icon). See an example of the toolbar on the right. The “Picture Catalog…” displays a list of all the pictures belonging to your document. “Picture Caption…” allows you to add a caption to your picture via a text object that uses a specific style template. “Put to back” puts the activated graphic object (you will see this by the handles around it) behind the other graphic objects which are not activated. “Bring to front” brings the activated graphic object in front of all other graphic objects. “Put behind the main text” (only in the context menu for graphic objects, not in the main “Graphics” menu) places the graphic object behind your main text. “Table…” opens a dialog to create or edit an entire table. “Table Cell…” allows you to change the cell width, minimum height, margins, and text direction and contains the option to merge and split cells as well. “Calculated Field…” opens a dialog in which you can enter a calculation formula for a table cell in order to carry out a variety of calculation options, such as multiplication, calculating a sum of fields or columns, etc. “HTML Table Properties…” determines whether and how table widths will be exported to HTML.